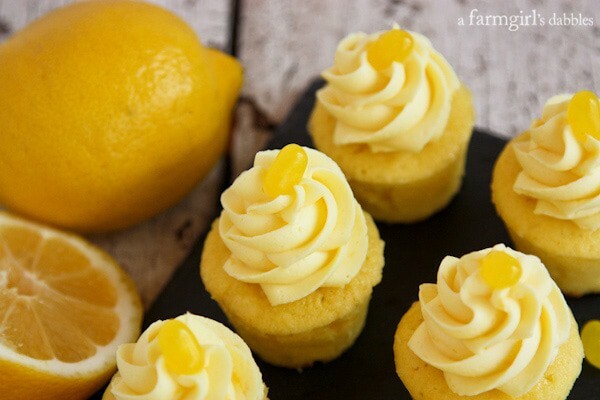 As our youngest daughter’s birthday approaches each April, my mind turns to lemon desserts. Lemon is her flavor and yellow is her color, and it all fits quite appropriately into the arrival of spring each year. I’ve always had a heart for bright lemon in early spring, and can’t imagine a better way to celebrate our sweet girl. 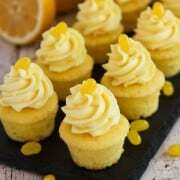 These Triple Lemon Baby Cakes with Lemon Pudding Cream are ultra moist and wonderfully lemony. 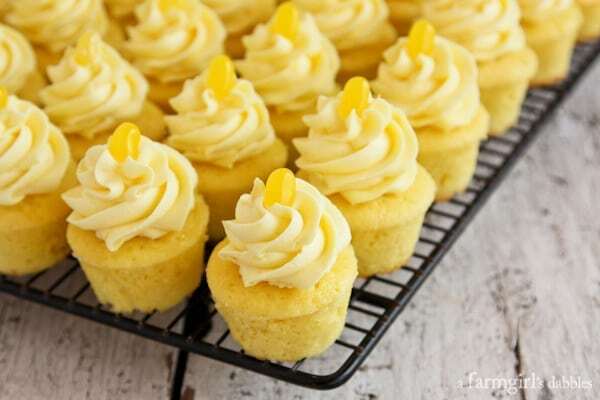 Tessa fell in love with the vibrant little bites of lemon cake I made for her birthday last year, so I knew I needed to make them for her again, but this time with triple the lemon goodness! Tessa turned seven today. 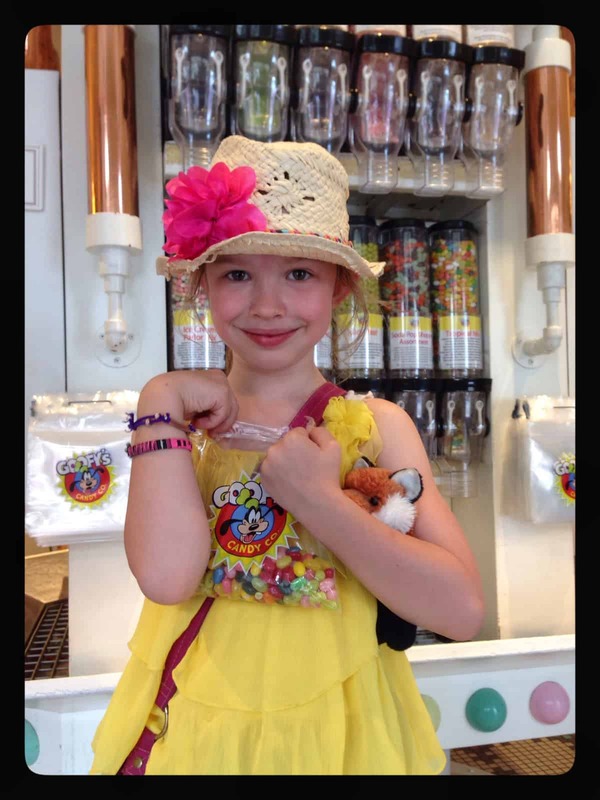 This photo of her was taken almost a year ago, when our family traveled to Orlando together so I could attend Food Blog Forum at Walt Disney World. While staying at the Grand Floridian (it IS grand! ), where the conference was held, we hopped on the monorail for a super short ride over to Magic Kingdom for a day. And anyone who is part of my family knows that you simply must make a stop at the Main Street Confectionary when visiting this awesome park. It’s a tradition, one that I’ve been upholding with my own family since my parents took me there throughout my childhood. When we walked inside the Main Street Confectionary last spring, Hatti headed straight for the homemade confections under the glass pastry cases, most of which were dipped in chocolate and in the shape of a mouse with two large ears. But Tessa? She found the giant Jelly Belly jelly bean dispenser in the middle of room, and she hung tight. Jelly Belly jelly beans are one of her deepest candy loves. 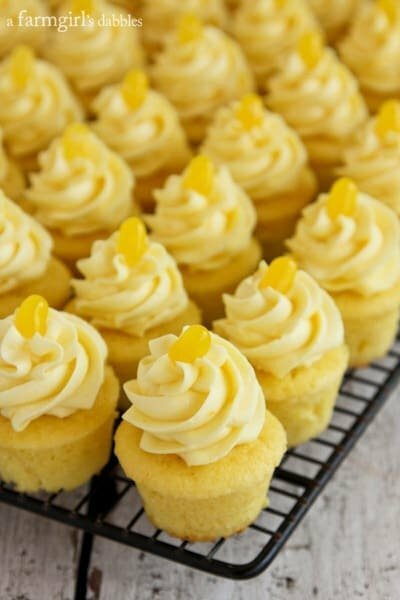 And that is exactly why these mini cupcakes are topped with a Jelly Belly jelly bean. No other brand will do. You already guessed that they’re lemon flavored, right?! The lemon pudding cream swirled onto the tops is really quite lovely, with a super smooth texture and lightly lemon flavor. After I discovered the stabilizing quality that dry pudding mix adds to freshly whipped cream…watch out, World! My family simply adored the chocolate chip angel food cupcakes that I recently made, topped with a vanilla cream that incorporated dry pudding mix. I’ve been waiting for my next opportunity to play around with this concept again. I promise you, this lemon version is awesome, too! Today also marks the 4th anniversary of a farmgirl’s dabbles. FOUR years, folks! Thanks for hanging out with us. We appreciate each and every one of you! Whisk flour, baking powder, and salt in medium bowl and set aside. In a large bowl, beat butter until smooth. Add sugar and beat to blend. Beat in eggs 1 at a time, then the lemon juice, lemon peel, and food coloring. Batter may look curdled, but that’s just fine. Beat in the flour mixture alternately with the buttermilk, in 3 additions. Fill mini cupcake wells or liners a bit more than 3/4-full. Bake cupcakes until tester inserted into center comes out clean. This took about 20 minutes for me, but it will depend on the size of your pans, so pay close attention to your baking time. Cool 10 minutes and remove from pan. Cool completely before adding frosting. Place whipping cream, pudding mix, and powdered sugar into a large chilled mixing bowl. Beat with a chilled whisk attachment until thick and stiff. Add lemon zest and food coloring, mixing to combine thoroughly. 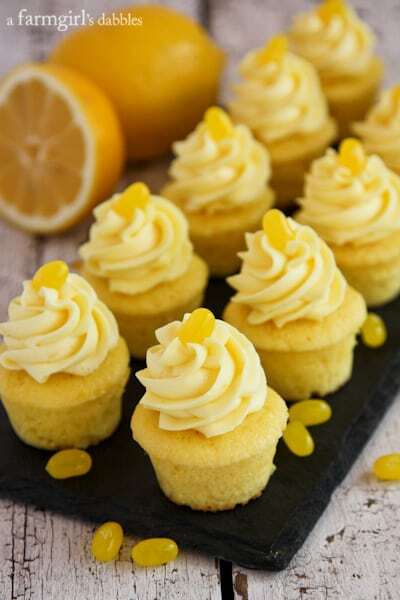 With a medium star tip, apply swirls of lemon pudding cream to the tops of each mini cupcake. Top each with a lemon jelly bean. Serve immediately or chill until ready to serve. These freeze well, but wait to add the jelly bean until right before serving. from a farmgirl’s dabbles, cake recipe adapted from here and here.